A storm that came late in the season, the March 2013 blizzard (dubbed "Virgil" by the folks at the Weather Channel) caught many off guard in central Illinois. In the Champaign-Urbana area, local schools cancelled class first. Then, the community college. And at about 9 pm, the University sent out a mass email, warning UIUC spring breakers not to attempt the drive back to campus. Finally, at about 1:30 am, Illinois officially cancelled classes. When it finished here in Urbana, Ill., the storm dropped more than 11 inches, breaking the previous March 24 snow record. In my hometown of Springfield, it dropped 18.5", beating a single-storm record that persisted for 113 years. Snow began falling at about 2:30 pm on March 24. 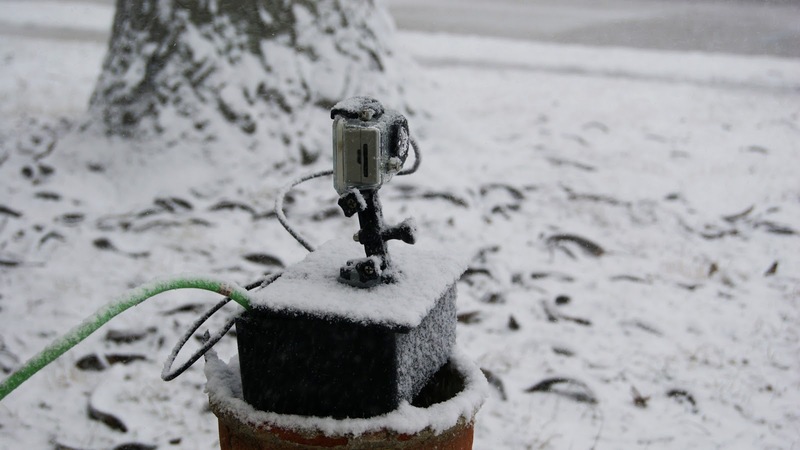 As soon as the snow began to fall, I started building a time-lapse setup, and took my first pictures at 2:38. While I've detailed here before how to make a time-lapse camera, those previous designs were battery-powered, and had a life span of 12 hours. Like the previous build, this used a camera presupposed from an unmanned aircraft system. But the forecast called for a snow that could last up to 20 hours, so I designed this setup to run on AC power instead. As it turns out, it's much less complicated to run a time lapse camera on AC power. No battery calculations are necessary. All that's required is the camera, the camera housing, an AC extension cord, a USB cable, and an AC to USB adapter. Time-lapse weather camera at 2:39 pm on Sunday, March 24.